George W. Bush - Adams and Jefferson, Aaron Burr, Democrats. Fate has dealt some unexpected challenges to George W. Bush. Just 14 months ago he was elected President in what will be one of the most controversial elections in the history of the nation. For sheer excitement the only election that comes close is the 1800 contest between Adams and Jefferson where the ultimate choice, dictated by a flaw in the Constitution, was left to the House of Representatives between Jefferson and his Vice Presidential running mate, Aaron Burr. 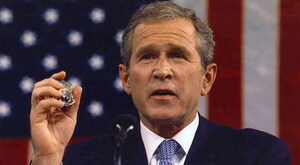 Taking the oath of office in January it was clear that Bush would be challenged by the outset by activist Democrats, who sensed that the closeness of the election robbed Bush of a mandate to govern from the right. A further blow to the administration was the defection of James Jeffords from the Republican Party, making Senator Tom Daschle the leader of a Democrat/Independent majority coalition. The Democrats, faced with a complete loss of power for the first time in modern history sensed that it was necessary to stand up for the interest groups they represent. Unlike the Republican revolutionaries of 1994, the Democrats were well aware that the nation can not be governed from the Congress. They set out to do to Bush what Clinton had done to the majority Republicans so effectively in the 90s, to paint him as a clue less right winger intent on rolling back years of Democrat policies. If they could stymie the Bush agenda they could at minimum look forward to the Congressional elections in 2002 in the hope that they could increase their numbers and perhaps wrest control of the House. Democrats, the party of Congressional control since the days of Roosevelt know how to operate legislatively. They know all the levers, buttons and rules. They had stood up to Nixon, Ford, Reagan and Bush. I feel a good deal of sympathy for George Bush. Here is a man who is certainly honest, well intentioned and who earnestly believes that changing the tone in Washington is good for the republic. But it seems like every time Bush makes some progress the ducks come down and start nibbling him to death. Executive and judicial appointments are a particularly nasty area for this administration. While the initial threats to filibuster or defeat key cabinet officers was largely bluster the role of deferred or stymied appointments grow with each passing day. Operating under the cover of "concern" the Senate Democrats have declared a guerilla war against the administration. It’s likely that there is no President in history who has seen more opposition from the Senate over the appointment of executive and judicial officers. There is a philosophical argument about how broad the authority of the Senate should actually run. Certainly the founding fathers would look askance at the idea that competent and honest men would be denied office because they were the President’s men. But they were more than just philosophers, they were politicians and they would understand that Senate consent is more than just a part of checks and balances. It seems that each day some on the right are calling for the President to spend his political capital on confirmation battles. The argument is made that each nomination that is delayed or defeated is a blow to Presidential power, that if the President does not stand and fight he will be diminished by these losses. And that’s true, in a tactical sense, but should a President be involved in every fire fight that breaks out in his administration? The demands for expenditure of political capital is unlimited and yet the supply is limited. Bush can only earn more through political success. Is it really a wise use of a scarce resources to reinforce potential failure? A wise commander picks fights he can win, or throws his reserves into the balance when he knows it will make a difference. I think Bush can make lemonade if he follows the right path. To do so starts out with the realization that his ability to appoint officials might be enhanced come next January. If he Republicans gain control of the Senate the logjam of appointments will turn into a torrent of action. If the Republicans do not gain control of the Senate then Bush will be condemned on that front to at least 2 more years of a holding action. The best means to squeeze those lemons is to enhance the idea that the US Senate is acting as an obstructionist body. This means a focused program of appointment and nomination designed to clog the agenda of the Senate. Why not as attractive as an outright fight with the Senate over a particular nomination, it can’t but help to go noticed in some corners of the press that a growing backlog of nominees pending action, action which is a constitutional duty, makes the Senate look less and less bipartisan every day. What can be helpful is the supporting arguments that are generated by the supporting players. The justices of the Supreme Court frequently speak out on issues of judicial administration and the key item they comment about is the ratio of judges to positions. Justice delayed is justice denied and as the number of judgeships rises it has implications for the entire system. The Democrats have once again provided the argument to their own undoing. They tout the importance of judicial ratings from the ABA and they cling desperately to the lie that they are concerned about competence and temperament, not politics. But we know that’s not true. Their chief concern is nothing more than keeping conservative judges off the federal bench. You can’t play the race card for every nominee, they can try put at some point it becomes tiresome. Assuming the administration does the proper vetting then the nominees should earn passing marks from the ABA. At some point their inaction begins to look like the blatant political power play that it is. Much the same can be said of the executive branch nominees. and here there is an even more important point to be made. While Congress may authorize certain officers and positions in the executive branch, there is no rule that the President must fill those appointments. The President should provide to the press a list of offices that will not be filled. Such responsibilities that are carried out by those offices will be distributed among the cabinet departments. Or in some cases those responsibilities will just go unmet. I would like nothing better than to see a Senator in high dudgeon over the fact that the President has not appointed the Assistant Deputy Under Secretary for Parking Assignments at the Education Department. A land of opportunity and a target rich environment.